All of us have experienced acne or are still suffering from it. For most people this problem resolves quickly, but for some, it is a problem that continues well into adult life with recurrent outbreaks of redness, blackheads, and pimples that can lead to permanent scarring. Acne, also known as acne vulgaris, is the most common skincare condition. It occurs when your hair follicles become plugged with oil and dead skin cells. It is characterized by comedones, papules, nodules, pimples, and scars. Acne can also be emotionally scarring. We understand what our patients are going through, so let us help you at our Acne Clinic. At our clinic, we have several effective treatments. We start by assessing you for medically treatable causes of acne. It may be a matter of managing a medical condition such as a hormonal issue. There are a number of medications and skin care products that can help. Does your diet play a role? There is no strong correlation between acne and diet; however, diets high in sugar can worsen acne. 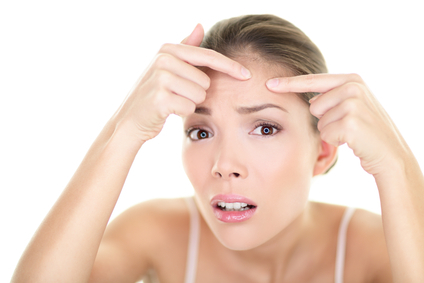 Yes, there is a link between stress and acne. Stress causes an increase in stress hormones, which is a factor of acne. Is it bad to pop your blemishes? Yes. Squeezing blemishes causes the infected material deeper into the skin, resulting in more inflammation and possible scarring. Come and visit our clinic to treat your acne.